Police make shocking discovery after pulling over dangerous driver in Rahat; driver, daycare worker flee the scene. Police in the Bedouin city of Rahat in southern Israel were appalled to discover 25 young children in a single van on Wednesday morning. Police ordered a van driver to pull to the side of the road after witnessing him engaging in dangerous driving. After stopping, the driver quickly exited the vehicle and ran away. Officers approached the vehicle and were stunned to find 25 small children crammed into the 8-seater van. The officers followed up by locating the daycare center that had been the driver’s destination. When they arrived, they found it closed and locked; after a brief investigation they realized the woman who runs the daycare had fled the scene after being informed that police were on their way. Local welfare authorities were called to the scene to help with the children while police continued to search for the driver. 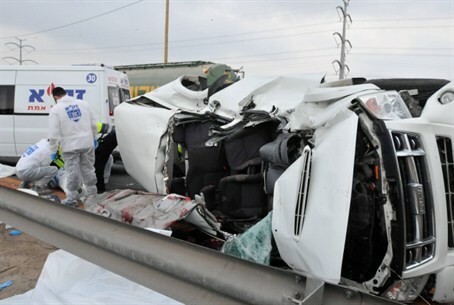 Elsewhere in the country, traffic accidents caused one death and multiple injuries on Wednesday. One person was killed in a crash near Nahal Amud, in northern Israel, at around 5 a.m. The crash involved a bus and a private car; the driver of the car, a man in his 30s, was killed. The bus driver was lightly injured in the incident. The bus had no passengers at the time of the crash. Four people were injured Wednesday afternoon in a crash between a truck and a car near the Migdalim junction in Samaria (Shomron). One of the drivers involved, a man in his 30s, was in serious condition following the accident. A second young man was left in moderate condition, and two others were lightly injured.